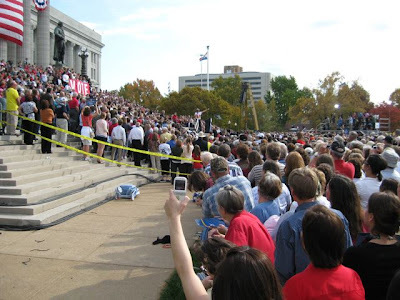 Sarah Palin Draws Massive Crowd in Missouri! 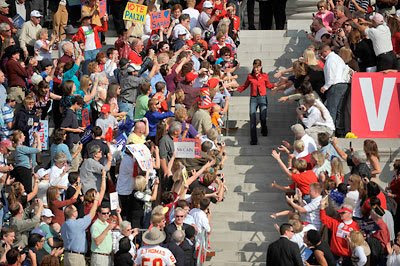 They were FIRED UP to see Sarah Palin in Missouri today! 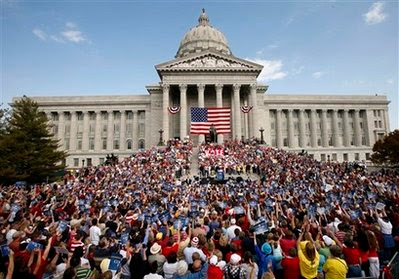 It was the second largest crowd in Jefferson City history. 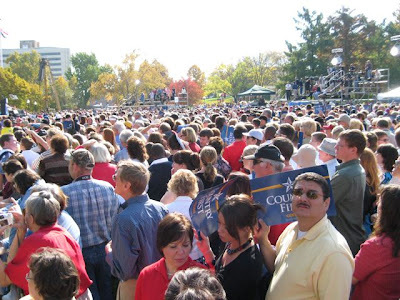 We have a crowd estimate! The Highway Patrol is saying 17,000 to 18,000 — more than the Kerry-Edwards appearance here four years ago and probably second only to Mel Carnahan’s funeral in 2000. 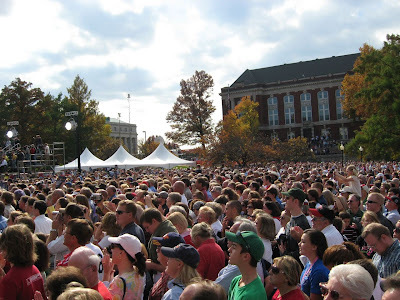 Meanwhile, in Lee’s Summit, Missouri, outside of Kansas City 400 people showed up to see Democrat Joe Biden. Vice presidential candidate Joe Biden urged supporters in Lee’s Summit Monday to work hard in the closing hours to elect Barack Obama to the White House. “Thirty-seven hours!” he told some 400 supporters in the gym at Longview Community College. And, once again the mainstream news comes out today with its latest report on how Sarah Palin is costing McCain the election. Sadly, this has become the norm from the mainstream media. It was a beautiful day in southern Missouri.